Each one of these major social networking sites gives you an amazing opportunity to start the sales cycle through reaching your market, nurturing relationships, amplifying your brand and implementing your B2C and B2B lead generation strategies. But how do you get the emails you need from your Fans and Followers? How do you take your social relations further along in your sales funnel? In other words: do you know how to generate leads? In this article, I give you tried and tested methods to reach your markets - and get email leads - from the top 5 social networking sites. 1. Run sweepstakes - Host email-gated Facebook sweepstakes or Facebook contests to generate leads, and build excitement around your brand. Contests on Facebook also give you enticing interaction with your prospective customers. They can quickly spread to friends of Fans, increasing your targeted lead generation. 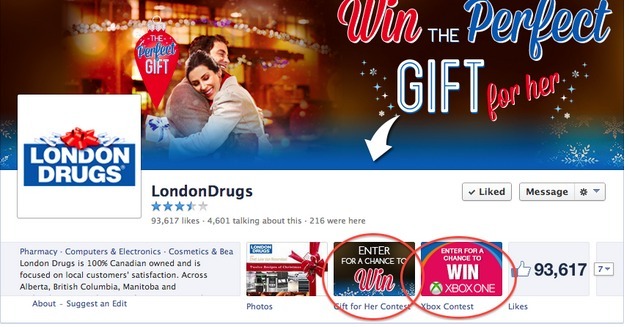 Smart companies like London Drugs generate email leads - and sales - through Facebook contests and sweepstakes. 2. Give email-gated discounts - Coupons generate sharing, immediate sales, and more email leads for your business. Host coupons or group coupons directly on your Facebook Page to drive engagement and get warm leads for your email marketing campaigns. 3. Post links to an email-gated landing page - Include email-gated content as part of your regularly scheduled content on Facebook. If you have a webinar, exclusive deal, or ebook available, tell your Facebook fans. 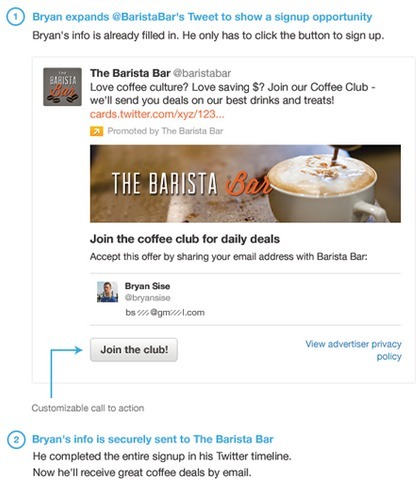 Direct them back to your email-gated landing page on your website. 4. Make a newsletter sign-up Tab - Create a customized newsletter tab on your Facebook Page, to make it easy for your Fans to get your letters. Give away exclusive offers to make it more enticing. 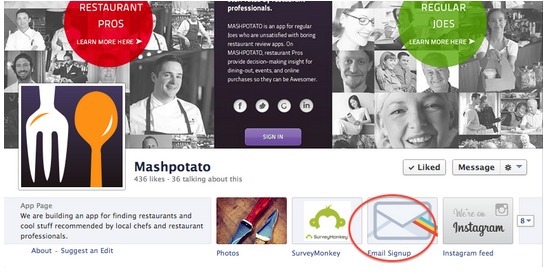 Use Facebook tabs for your newsletter signups, like Mashpotato does above. 5. Host a Facebook event, with your own email-gated landing page - Use your own email-gated landing pagefor RSVP’s (i.e. don’t use Facebook’s event RSVP app - which doesn’t give you email lead generation options), to a live or online event. Make it an exclusive and enticing event to generate tons of new leads. 1. Host an email-gated contest - Run a contest on Twitter, such as a vote contest, photo contest or even a video contest. Entice participation with a great prize. Gain leads through making email the field of entry. 2. Use your bio to link to an email-gated landing page - A lot of businesses still miss this easy opportunity. Update your Twitter bio to include a clickable link to a popular landing page on your website. Make an enticing CTA to improve your click-through rates. 3. Entice emails with coupons - Host your business coupons directly on Twitter (yup, you can do that! - well, with our help). Email-gate your coupons to generate leads from interested consumers. 5. Post links to email-gated content - Provide content on your website that you give away for free. You could host an informative webinar, produce an industry related ebook, or compile product tips in a PDF. Then enable people to download for the mere cost of an email. Post updates to Twitter about it - and use appropriate hashtags to get it spread. 1. Create a “free stuff” Board - Pin updates on your “free stuff” Board linking back to your email-gated website content. Use keywords in your pin descriptors to get your content found by interested people using Pinterest search. 2. Offer exclusive deals - Some of the most repinned content on Pinterest are coupons and deals. Create coupons on your website, give them away for the cost of an email, and pin your great deals to your Pinners. 3. Host a “Pin it to Win it” Contest - Create a “ Pin it to Win it” contest, and direct entrants to an email-gated landing page on your website. 4. Entice Pinners with images - Pinterest is an extremely visual site. When you are pinning links to email-gated content, make sure they’re visually appealing and connect with your market on the site. When relevant, use lifestyle images such as of food, crafts, and fashion. 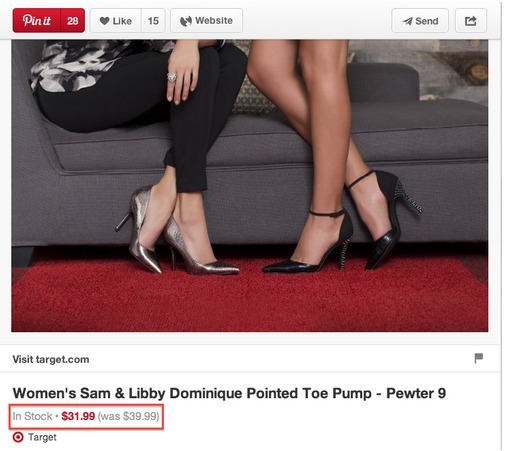 Target uses Rich Pins to drive sales. The Pin (with current pricing) links directly to their sales cart landing page. 5. Use Rich Pins - Pinterest has Rich Pins which enhance your pins with real-time updates from your website. For example, product rich pins show the price of your products - and will be automatically updated if you change them on your website. Rich Pins increase click-through rates - according to Pinterest. Use them to drive more traffic to your email-gated content. 1. Segment with Circles - Google+ has some cool features for posting updates. You can create Circles to categorize your connections. The neat thing is that you can use the feature to segment your updates (if you choose). This way you can craft targeted updates to segments of your connections, to drive traffic to email-gated content. 2. 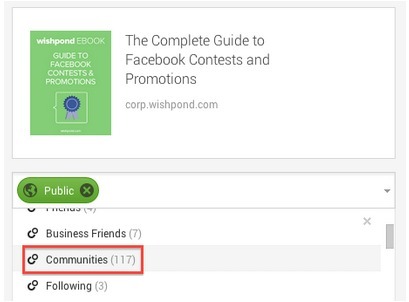 Join Communities - Find Communities on Google+ that relate to your business niche. Join and engage on them. When you’ve established yourself and your credibility within a Community, share links to your email-gated landing pages. 3. Host contests on your website - Post updates with links to your email-gated contests, such as an essay contest, vote contestor photo caption contest, on your Google+ page. Use an enticing image that reflects your prize, include brief contest details. Use hashtags such as #contest. Post it to relevant Communities too. 4. Entice emails with coupons - Create a coupon campaign for your ecommerce or brick and mortar store. Post links to your coupons, or group coupons on your G+ page. Update it to your ‘customers’ Circles, use hashtags, and post it to relevant Communities. 5. Host email-gated Google+ Hangouts - Set up an interactive video chat through Google Hangouts. Make a landing page for participants and viewers to RSVP, and you get to collect those lucrative emails to continue your lead nurturing. 1. 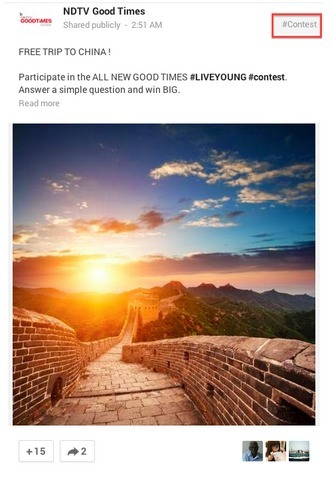 Host an Instagram photo contest - People on Instagram love to share their photos. Cater to this desire by running a cool photo contest on the site. Use a contest specific hashtag, to extend the reach and searchability of your campaign. Email-gate it, so that entrants must give you their email to enter. 2. Events - Post photos of business events you’ve hosted, and promote upcoming ones. Show photos of formal events you’ve hosted, and give your Instagram Followers an exclusive behind the scenes look too. When you’re promoting upcoming events, send traffic to an RSVP landing page, for customers to reserve their spot via email. 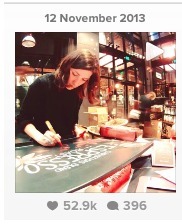 Starbucks posts loads of events and customer-centric images on Instagram, including this cool stop motion video showing behind the scenes look at staff preparing for the holiday rush. 3. Give email-gated coupons - Everyone likes a good deal - regardless of what social networking site they source it from. When you are promoting your email-gated coupons on Instagram, include an authentic image, preferably of a real customer enjoying the specified product. Use hashtags, including product and campaign tags. 4. Geo-tag your updates - Instagram is a mobile social sharing site. Almost anyone with a phone these days can be using Instagram wherever they are. Use geo-tagging to promote engagement with your locale, and drive more traffic to your email-gated events and landing pages. 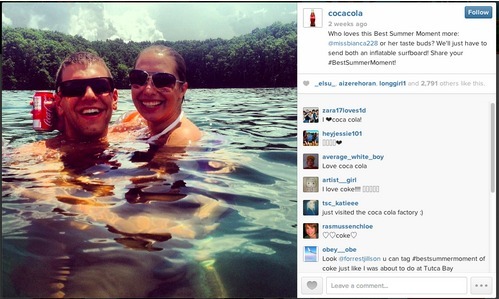 Coca Cola knows how to focus on their customers, by hosting Instagram photo contests, and posting the many winners. 5. Focus on your customers - Instagram is a very personal, authentic site. Engage with your followers by sharing their photos, tagging them in your updates, and quickly responding to all comments made about your brand. You’ll get to be known as a cool, responsive company who understands the needs of your niche on this site. Once you develop this brand image, post email-gated content, and you’ll get more results. If you were interested in knowing how to generate leads it should now be clear that social media can be an incredibly effective method for this purpose, as they continue to nurture your sales relationships. Once you’ve gained an understanding of how to market on each site, use them to best generate leads through email-gated conten, even if you want to achieve B2B lead generation objectives. What do you think? Do you generate email leads from Facebook, Twitter, Pinterest, Google+ or Instagram? 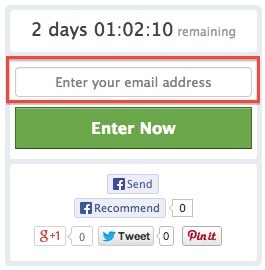 Do you use email-gated contests? What tips do you have? Share them in the comments, below.